Working at Resch, I’ve enjoyed valuable opportunities to work with clients that specialize in senior services. Through these engagements, I’ve been able to learn about the amazing array of approaches physicians and caregivers can use to help meet the needs of people aging in Michigan. Our clients are doing phenomenal work and I’m honored to be part of their growth. The market research our firm has done for these clients shows many interesting trends among today’s senior population. The baby boom generation is aging differently than their predecessors did, choosing to remain in their own homes longer and prioritizing dynamic, connected lifestyles. These inclinations are shifting the demands placed on senior service agencies and causing a re-imagination of what today’s retirement facilities should look like. They also pose unique challenges for families trying to manage and preserve their parents’ independence, particularly in a high-tech society. Remember the SNL spoof about Amazon Alexa? IT’S SO TRUE. I could throw out a lot of data here, but instead I’m going to tell you a story. This past Easter with my sister, Shelly, along with mom and dad. This past spring, my 85-year-old dad had a medical crisis. My mom, who is just 72, found herself unexpectedly trying to manage a series of issues that were physically, emotionally and intellectually demanding, so my sister and I began coordinating support for both of them. Shelly and I are blessed with a strong, symbiotic relationship, so it’s been easy for us to harmonize our thinking and swap stays in their southwest Michigan home when necessary. As our family has pulled together and interacted with other seniors in our region, we’ve learned a lot about the unique challenges today’s aging people face. Modern high-tech culture makes things at once simpler and far more difficult—and senior service agencies and physicians alike are only beginning to adapt in response. The Internet is a friend—and an enemy—to seniors in 2017. Yes, you can find lots of medical information, buy supportive devices, and locate important household how-to videos when problems arise. But (and I just learned this yesterday) the brain atrophies as we age; sometimes cognitive blips can cause information to be misunderstood or misused. Google the wrong thing, fail to accurately assess its credibility, spend money you don’t have, or misinterpret the instructions you find, and disaster can ensue. 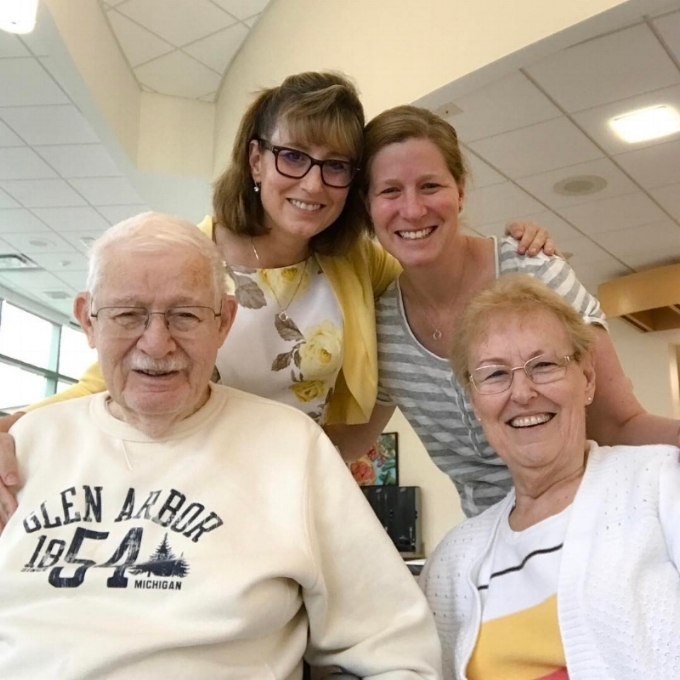 The web does, however, provide hugely valuable connections for families, as well as apps and tools we can use to help manage senior care. It is a big job to find and deploy the right tools as a caregiving partnership, and there are huge opportunities for senior service agencies to help out. Medical providers also can help families by getting online. Many of Dad’s physicians are linked into the same system and have online records for my sister and me to access and discuss, wherever we are. But too many other providers in our lives don’t have email and are forced to send critical reports to us through the post office. Worse still is the thick stack of paper forms that must be completed every single time a physician is consulted, even if that provider is looking at Dad’s records online and seeing notes entered by others. This arduous work is then followed by the 20-minute verbal review of the paper and online records with the family, which must be done OVER AND OVER AGAIN (gaaaah!) and wastes time that could be spent rendering care. This was particularly irritating when Dad had to visit the ER for a possible cardiac episode. While not every senior is good with computers all the time, their professional caregivers should be—and should know that electronic records truly are reliable when used by well-trained staff. We trust online tools with our taxes, our education, our NUCLEAR POWER FACILITIES, and our government—why not our medical care? The soft stuff matters most to families—and is most often ignored. When I sent my child to day care years ago, I got a written little report of his day at pickup. Yet when my dad went to a nursing home for a week, we never heard a peep from anyone unless we were practically banging on the nurses’ desks à la Shirley MacLaine in Terms of Endearment. Senior housing providers would do well to provide a little daily email for families to share, particularly when children and other loved ones are far away. Such notes could be fairly routine—perhaps even just a quick data snapshot—but would help document changes, make folks feel more connected, and even encourage more frequent visits. The help that’s most often needed is practical in nature. What I wish most for my parents is that some enterprising so-and-so would develop an Über-like service to come help with intermittent household items. My folks have histories of hurting themselves moving pieces of furniture, causing massive problems trying to fix their own phones and computers, and creating lasting issues on things they thought would “only take a moment.” Being able to get someone right away to come over and fix the odd job here and there for a fee would be a HUGE help to our family. A curated network of providers in our area would be enormous, and would help Mom and Dad live independently for far longer. You’re welcome, future millionaire entrepreneur. So there you have it, folks. Market analysis and solution-naming that’s entirely based on my own wish lists and pet peeves. But while my experiences are perhaps one-off or isolated, I know there must be others experiencing similar issues as they try to love and help and coordinate support for their parents. We’re all going to get there with our loved ones at some point in our lives, God willing. When we do, we must begin to act as stronger advocates for a system that works in the modern era, so it can be ready for us when we need it ourselves.